The Technology behind our process makes us and our capabilities extremely unique. 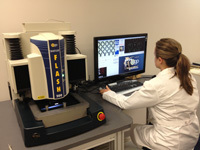 We combine various technologies to offer comprehensive laser micromachining services. New applications are evaluated according to the type of material, complexity of the design, dimensional requirements and tolerances. A step-by-step method is used to determine the optimal laser process for prototypes and production parts. We've acquired the latest version of the Smartscope Flash System 200 for its Quality Assurance Systems adding to its family of OGP Microscope Systems. 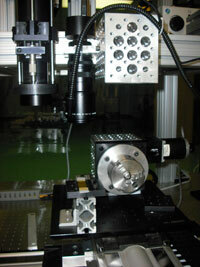 The OGP Smartscope laser scan allows measurements of depth and width with single micron slots and holes in opaque materials produced by Excimer Laser imaging and micromachining techniques. In addition to great optical performance, it is equipped with a laser scan system. This non-contact point sensor can focus its light very precisely, providing a small spot size and extremely accurate surface focus while measuring.